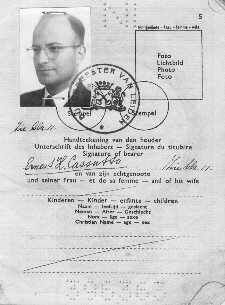 Dr. Isaac Cassutto settled in Probolingo, Indonesia in 1915 during World War I, a conflict in which his nation, the Netherlands, was neutral. 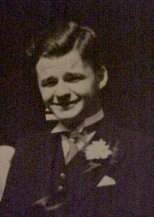 His second son, Ernest, was born on December 1, 1919 just after the Treaty of Versailles had been signed. The family moved to Bandung on the island of Java as Isaac found a teaching position in the area of Dutch colonial law. Ernest grew up aware of his Jewish heritage, but his family was by no means active in religious affairs. 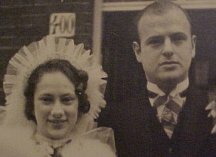 Ernest's family moved back to the Netherlands in 1934. It was a great transition from the tropical, Polynesian culture of Indonesia for the young Ernest. In neighboring Germany one year earlier, Adolph Hitler had risen to the chancellorship, and he was consolidating his power through terror and intimidation. In 1939, Ernest came to know a woman with whom he quickly fell in love. Her name was Hetty Winkel, and they were engaged that year. It was the same year that Germany had surprisingly signed a non-aggression pact with the Soviet Union, and later attacked Poland, which constituted the start of the Second World War. Ernest was inducted into the Dutch army, but was discharged shortly thereafter to return to school. The world waited to see what Hitler would do during the period of late 1939 to early 1940 called the sitzkrieg, where both the Allies and the Axis powers watched and waited while amassing arms and assessing each other's strength and weaknesses. Hitler was preparing for a massive attack westward. Germany invaded Holland on May 10, 1940. The military conquest of the small nation was completed in five days, along with that of Belgium and Luxemburg. Within one year of the Nazi occupation, the Jewish population of Holland came under severe persecution. By May of 1942, all Jews had to register with the Gestapo, the German secret police, and all Jews had to wear a yellow star of David to identify themselves in public as Jews. If one had three out of four grandparents who were Jewish according to Nazi racial policies, one was required to follow these restrictions. Round-ups of Dutch Jewish citizens had begun in 1941, moving to full scale arrests and deportations by late 1942. Ernest and Hetty decided to go into hiding together in summer of 1942. 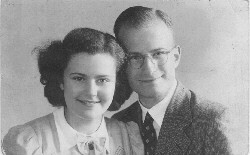 Sometime in 1943, the couple was separated. Ernest later learned that Hetty had been arrested by the Gestapo. He would never see her again. She died in Auschwitz in January of 1944. Ernest had gone underground, meaning that he went from safehouse to safehouse seeking refuge from Nazi arrest. This hide-and-seek went on until March of 1944, when his hiding place had been discovered by the Nazis. Ernest's family had separated and survived the war without being discovered by their Nazi occupiers (but Ernest's older brother Max had been captured by the Japanese as they overran Indonesia, where he had made his home. Max would not see his wife and newborn son for five years). Interrogation by the Gestapo was painful and humiliating. Ernest was taken to the headquarters of the Security Police in Rotterdam, a major port city in the southwest of Holland. Rotterdam had experienced terrible bombing by German forces in 1940. It was there that Ernest was questioned on the whereabouts of his family, other Jews, and the activities of the Dutch underground. Solitary confinement involved imprisonment in a small five by seven foot cell with a thick steel door. Upon it was posted the yellow star of David that Ernest had been forced to wear, indicating the status of the prisoner contained within. The prison also housed criminals, those who had been deemed anti-social by the Nazis, homosexuals, pacifists, and communists, all bound for the firing squad or deportation to slave labor or extermination camps in Germany and Poland. Ernest was given starvation rations of tulip bulbs and sugar beets fried in grease. He was totally alone, except for a Bible that his Nazi captors allowed him to read, and the newfound faith he had discovered while in hiding. He expected to be included in the final deportations of Jews from Holland to the East. The war was going poorly for the Germans, and an invasion of Hitler's "Fortress Europe" was imminent. The Nazis were attempting to complete what had come to be called the "Final Solution" on the order of a leader who had been growing increasingly unstable and irrational. Only a few months later, his own generals would attempt an assassination (July, 1944). It was in this atmosphere that the final deportations and exterminations were being carried out. Somehow, the yellow star on Ernest's door had been removed, and he had been left behind. The Germans would later call him "The Last Jew of Rotterdam". Ernest was assigned to slave labor outside Rotterdam during the time that the Allies were racing across western Europe into the heart of what was left of Nazi Germany. During this time, Ernest had befriended a member of the Dutch civil police force, who was in contact with the Dutch underground. As they moved to and from the slave labor camps, the guard obtained a pass for what Ernest was told would be his "final shower." Instead, the guard and his charge left the camp and went into hiding. Two days later, on May 5, 1945, Canadian and British forces liberated Holland. Ernest was reunited with his family, who had survived in tact. But 150,000 Dutch Jews would not return from the camps. Germany surrendered on May 7, 1945. George soon after World War II. George would change his last name to have one T after the war. The story, of course, does not end here. To find out how Ernest met Elisabeth, read the epilogue. But first, learn about the experiences of Ernest's future wife, Elisabeth Rodrigues. Enjoy the real success with exam sscp certifications and ccna security Certification dumps online training programs. Also prepare for next level with quality of testking ITIL V3 Certification dumps, testking 650-393 certification guide and testking 642-647 voice pdf dumps.